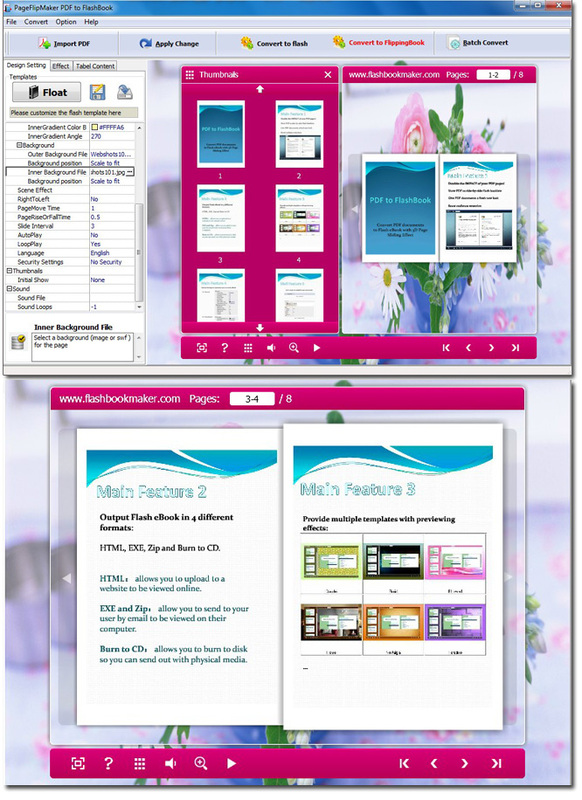 Free PageFlipMaker PDF to FlashBook is a flash book creator help users to convert PDF to flash digital book. This is a new way to show PDF with slide by slide flash booklets which can boost audience retention. Feature one: import PDF with link, search, table contents and define quantity of flash book. Support batch convert for large quantity of PDF files. Feature two: comprehensive designing function and multiple templates with previewing effects. You can set background layout and sound, define tool bar color and book frame bar, change language for sliding book and modify slide orientation. Feature three: a series of animation effects to choose (air bladder, black spots, drip-drop, bubble and more). Feature four: output flash eBook in 4 different formats (HTML, ZIP, EXE and burn to CD). In addition, you can publish for mobile version like android mobile phone.